Fresh from the euphoria of writing a novel, Emperor Dad, just for fun, I decided to do it again. So I had to pull an idea out of my hat — any idea. Aliens! That’s always a good science fiction idea. Better yet, since this was just for fun, rather than a serious deep science fictional analysis, Roswell Aliens! Now, I have been going to New Mexico all my life. Blue Haven is a summer camp where I and my children attended over the years, in the mountains outside of Las Vegas, New Mexico. Many trips delivering the kids made me very familiar with the town, much more so than Roswell, which I had visited a couple of times, but wasn’t really my stomping grounds. So, the idea of a road trip came to mind. Roswell Aliens (1947), still alive in the current day. We’d have to have MIB, but by now there’d be in the second and third generations. So, a girl, daughter of a MIB courier, is hunting her missing father, and linking up with a motel kid, who knew her father as a regular traveling salesman who stayed at his family’s motel. I had to deal with the alien language problem. So why not a universal translator, and what better person to demonstrate that than the girl, mute from a cancer surgery. The story came together naturally, and I threw myself into the research. I dug into the alien mythos and discovered more tourist info about Las Vegas than I’d ever imagined. I even drove the 2000-mile road trip path myself, finding places of interest that I added into the narrative. Finding the sites of secret MIB bases in various towns was interesting, and I wonder what people thought when I walked around their property, identifying where the official and hidden entrances would be. As I realized they needed a bigger vehicle as they added more aliens to the party, I took my own RV and added it into the mix. Eventually, the story was done — and I needed another cover. This time, I had a niece who was making a name for herself with her artwork and I decided to give her a try. I had her make it look ‘cartoony’ to go with a poster in the book. It’s been a good fit, catching a lot of people’s attention of the years. 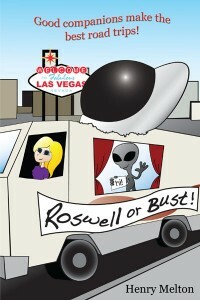 So, Roswell or Bust was a fun book, which tapped into a lot of my fond memories of New Mexico and traveling by RV. That’s why it’s my favorite.